Members of long-lost Boston college-radio favorites Scruffy the Cat — part of the so-called late-’80s cowpunk scene that helped spawn the alt-country movement — have reunited around cancer-stricken frontman Charlie Chesterman after two decades apart and will play two headlining shows in their hometown this October. The band is slated to perform Oct. 21 and 22 at old haunt T.T. the Bear’s Place in Cambridge, Mass. The concerts follow a benefit concert for Chesterman this past June that saw the singer/guitarist reunite with Scruffy bandmates Stephen Fredette (guitar), Burns Stanfield (piano) and Randall Lee Gibson (drums) on stage (see video below). While bassist Mac Paul Stanfield (Burns’s brother) and banjo player Stona Fitch couldn’t make the June performance, Gibson — posting on the band’s Facebook group — reports Fitch will play at the first of the two October shows. Gibson also noted that both performances will be recorded. Speaking to the Boston Globe prior to the June benefit, Chesterman said health issues — including Fredette’s now-in-remission lymphoma — had kept the band from reuniting. “Out of all of us, I think I’m the one that has been the biggest foot-dragger about getting back together. But between the health situation that Stephen has and I have, it’s kind of changed my perspective a little bit. If everybody really wants to do this and I’m the only holdout, then I just need to shut up and get with the program. Saw them at the Phantasy in Lakewood, OH – 1989(or 9?). Bought the t-shirt with the cat on it, was my fave concert tee, should’ve had it autographed by Charlie Chesterman since he was manning the merch. desk! Great news. I’ve been looking forward to this for years. I’ve played my vinyl copies of “High Octane Revival” and “Tiny Days” down to the core. 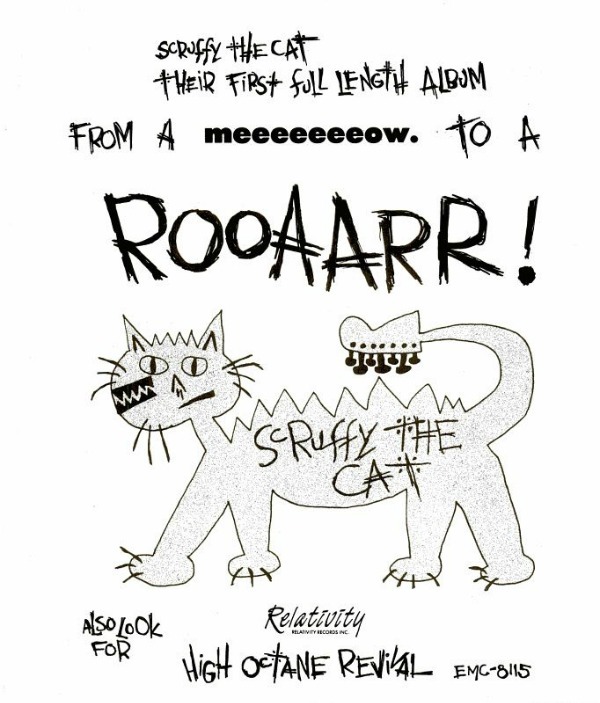 Would love t get my hands on a “Scruffy the Cat” tee shirt…any idea how?